Guest blogger Patricia Stricklin has been on a writer’s journey for many years. 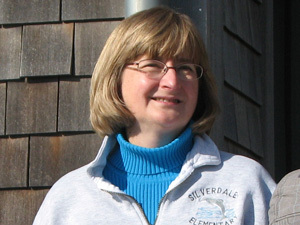 As an Elementary School Teacher she wrote curriculum for many subjects including her district’s Sixth Grade Astronomy Unit. Later, as a Learning Specialist, she created skits for school assemblies, and wrote short stories to inspire children who struggled with common everyday problems. In the past few years, she has written several picture books and a middle grade novel, GUTS AND GLORY. Presently she is working on the third revision of her young adult novel, THE OTHER SIDE OF CHANGE. For inspiration and to hone her craft, she meets frequently with her critique group and with her local writers’ support group. As a member of Society of Children’s Book Writers and Illustrators (SCBWI), she attends conferences and retreats. When she is not writing, she spends time with an amazingly large extended family and volunteers as a steward in Newberry Hill Heritage Park located a mile from her home. That’s Merci giving me an earful on how she’d react in this situation. She’s the main character in my YA novel, THE OTHER SIDE OF CHANGE, and she’s been talking to me for months now. When I mention this to my non-writer friends, they look at me like I’m a whack job. The reactions I get from my writer friends are a lot more reassuring. Those new to creating fiction are relieved when they find out this is a common phenomenon. Those who’ve been writing for a long time laugh knowingly. Some welcome it, others are irritated by it. For someone who lives in my mind and only exists on paper, she finds plenty to talk about. She pops up in the middle of the night, on walks in the woods, in the shower, or when I’m on auto pilot in my car. I’ve missed plenty of turns because of her. One of the biggest issues she’s been adamant about is her voice. I’m not much of a swearer myself, though occasionally I might let go a ‘crap’ or two. So I was finding it difficult to write Merci’s verbal reactions in tense moments. For a long time, it was all pure and clean. So I’ve let go of my inhibitions, and I’ve written what seems natural to Merci. She’s talked me out of scenes I loved, like my snowman scene. Her response was, “It’s too juvenile and too much blah, blah, blah.” It took input from my critique group, an editor, and some intense scrutiny to realize she was right. Now two paragraphs do the job perfectly, and they end in an intense revelation for Merci. Her comments are pretty compelling, so I listen. And the more I listen, the more connected I am to her and the more authentic she becomes. As I make my revisions, I ask myself, is this the real Merci? What would she do? How would she react? The answers have made her a stronger, more interesting character, someone I hope will tug at the hearts of her readers. Visit Patricia Mastel Stricklin at https://www.facebook.com/a.writers.trek. Guest blogger Imogen Knight is a Reiki Master Teacher, trained in Usui Reiki traditionally in the 1990s. Since then, having been in private practice taking on clients and students as well as facilitating her own Reiki circle, she has become part of the bastion of traditional practitioners fighting a losing battle against the new age, new reiki forms. She has now taken to writing novels with murder at the centre. She cannot imagine what brought this on. The narrative approach is one of the ways we make sense of the world and communicate our wisdom (if any!) to a younger generation. We also create narratives to describe our experience in ways accessible to our social circle, families and acquaintances using humour, horror, romance or some other narrative tool. Many of you have heard of Reiki as a healing modality – you may have had one or more Reiki treatments and experienced for yourself the way in which, at the very least, Reiki results in an extraordinarily good night’s sleep! You may also have heard the expression “Reiki goes where it’s needed” and assumed, as many modern practitioners do, that the expression refers to the flow of Reiki around the mind/body/spirit system, no matter where it enters. However, Reiki is more than a physical healing modality. With diligent practice, it becomes a healing path to spiritual enlightenment. Which all sounds very grand and important, but truth be told, most of us don’t really get there (or anywhere near!) – we like to believe that we are making progress, but, in the end, we are human and have our little ways. “Little” being the operative word. A judgement here, impatience there, resentment, pride, inappropriate choices … the ego trumps enlightenment on a daily basis. It is, however, Reiki as spiritual path that informs story. From the first day of training, traditional Reiki practitioners are invited to experience Reiki on more than just a physical basis. The Reiki circle is an integral part of each of the three degrees of training and is one of the ways that traditional practitioners bond each time they meet. More fully described in my book The Reiki Circle (did you see what I did there? A plug. For my book. Go buy it at your local Amazon. ), the Reiki circle is one method of making Reiki available in any situation, without breaking any rules. Rules? Reiki has rules? Who knew? Indeed. One of the ways we proceed to enlightenment is to moderate our natural impulse to change other people, rather than to focus on our own judgement of them as needing to be changed. There is, however, a little wriggle room available. Although forcing Reiki on someone who hasn’t been asked – and may well refuse it if they are asked! – is interfering, it is possible to make Reiki available in their situation. In this way, not only can it can be accepted or refused, but also it tends to throw a whole lot of light into the mix, resulting in changes of perspective, hidden details uncovered, coincidences leading to light bulb moments or even a slip of the tongue revealing a previously concealed motive. This is, at least in part, how Reiki goes where it’s needed. Given that Reiki goes where it’s needed and that it can also throw a whole lot of light into a situation, it seems but a small step from practice to writing thrillers. In my mind at least! My experience as a Reiki Master/Teacher for nearly two decades indicates that it is not only the spiritual, the healers and those who want to help others who are drawn to Reiki, but also the vulnerable, the broken, those in search of an “experience”, the sceptics … and the manipulators. The dark is often drawn to the light, if only in an attempt to obliterate it. Well, Reiki is its own protection … but you start where you start and sometimes that can be in a very dark place. Take a Reiki circle of friends. Outline the struggle for enlightenment of the central character. Murder a newbie for immediacy of involvement of said circle – mean, to be sure, but necessary for story. Add a sceptical police team. Mix in a manipulative murderer. Fold in a whole lot of Reiki. The result is a story driven by Reiki, but which also appeals to murder mystery fans – win/win, however you look at it! Great post Pat Stricklin! Welcome to the world of blogs! Enjoyed your conversation with Merci, Pat. We’ll done. Pat, I loved your post, particularly about getting real with Merci!! Great job!. I enjoyed your blog post, Pat! Our fictional “peeps” do come to life, don’t they? I’m glad Merci is keeping you on track. Let us know when your book gets published. I look forward to reading all about her! I enjoyed reading about you and Merci, your relationship, and how she guides your writing. I understand. 🙂 You came across as real and so did she. I’ve been reading about social media in The Rise of the Machines by Kristin Lamb, and how important it is to create a blog where people can get to know who you are. Good job! I wrote a nice comment and lost it. Now I don’t remember what I said, except that I liked what you said; it was real and so was Merci.